Cycle Compounds available in a wide variety of finishes and designs. 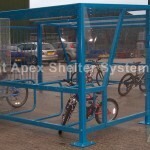 Easy to assemble offering secure storage for bikes for schools, universities and business premises. 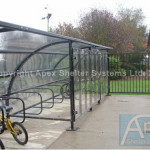 Where can I find the best bike and cycle shelters? Our designers can create bespoke canopy and walkways designs dependent upon our customers’ individual site requirements. Apex Shelters Canopies are also an excellent way to provide UV shade in playgrounds, either to cover external seating or provide shade whilst children are queuing or playing. 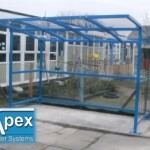 An Apex Shelters site surveyor can atend site free-of charge to measure up the area and provide a full quotation. This can include all necessary groundworks and installation costs, if required.On receipt of your order, CAD drawings will be supplied for your approval. Once the drawings are approved this will then go into fabrication. Crash pads can be fitted to the legs of the canopy, which are ideal for school playgrounds. All goods are manufactured in-house and canopies and walkways are installed by our skilled team of installers. 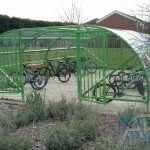 Because bike shelters have become commonplace amongst so many different types of organisation, it’s important to choose the product that best fits your circumstances. Luckily we’ve got 15 different types of cycle shelters, in a collection of sizes, shapes and materials from basic wood panelled shelters to coated steel contraptions. 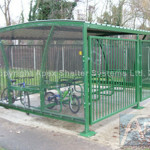 Many of our cycle shelters can also be used for scooters, and some are even adaptable to hold junior bikes. One thing they all have in common is that they are easy to assemble. We understand that time is precious in business which is why we make things as simple as possible. You’ll also be pleased to know that we offer rapid delivery times and even an installation service for our cycle shelters if you’d rather leave the hassle to someone else. 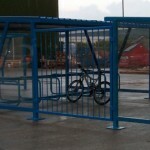 All of our bike shelters are also durable and robust, to withstand all weather conditions and to provide you with the confidence that your customers’ or staff’s bicycles are as safe as they can be. Customer service is our top priority which is why we’ll always strive to provide you with the right bike shelter for your location. Our team create bespoke entrance canopies, made to perfectly suit your entrance walkways. 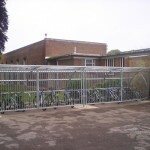 We understand that every building is different and as such every site has different requirements; some organisations will have a large number of people that join the commute via push bike, and as such we can a provide cycle shelter. In schools, we can provide shelters that can offer UV protection during the summer months and shelter from the rain during the rest of the year. Crash pads can be applied to the legs of your entrance canopy to ensure a safer environment for children. Outdoors play in schools and nurseries has even been highlighted as beneficial to young children by Ofsted so having the appropriate cover for all types of weather is important. Whatever your needs, we can meet them; our team can survey your location, acknowledge your requirements and offer you a competitive quote that includes ground work and installation costs, all for free. If you like what you hear, we will get to work drawing up the computer aided designs so that you might better visualise the work that we will be doing for you. 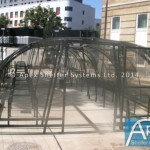 We can then discuss any changes that you would like to see made and once you’re happy we will begin the fabrication of your entrance canopies. Covered walkways, properly installed by professionals should look crisp, clean and modern, suited to your location and match your requirements, whether that is a cycle shelter or roller shutters for your canopy. We always work hard as a team to ensure that every element of your entrance walkways are just as you imagined them. Gates can be added to the Alpha Shelter to provide additional security. Gates are fitted with a hasp and staple (as standard) for padlocking. Padlocks are not supplied. Alternative locking methods, such as key operated or coin retain/return can be incorporated. 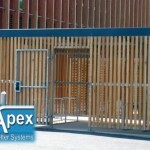 If the area is restricted sliding gates could reduce the footprint of the shelter. Gates can be added to the Theta Bike Shelter to provide additional security. Gates are fitted with a hasp and staple (as standard) for padlocking. Padlocks are not supplied. Alternative locking methods, such as key operated or coin retain/return can be incorporated. See Page 25 for locking mechanisms. If the area is restricted sliding gates could reduce the footprint of the shelter. 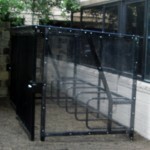 Theta Bike Shelters can be used to create a lockable bike compound by opposing 2 shelters. Lockable gates can be fitted to one or both sides allowing 2 entrances. Alternatively, one side can be fitted with a fixed security panel. A variety of locking mechanisms are available for the gate, including a hasp and staple (which is fitted as standard) or a sliding bolt, (padlocks are not supplied with either option), a coin return/retain or a card swipe system are also available. Roof panels can be fitted to the walkway to provide enhanced weather protection. Vandal resistant lighting can also be installed as required. 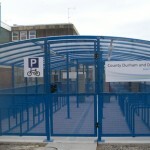 High-tech secure bike compound suitable to accommodate both bicycles and/or motorcycles. Manufactured with perforated sheets to the lower part of the shelter and solid transparent sheeting to upper, complete with a 16mm triple wall polycarbonate roof. 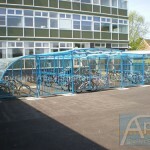 This bike compound uses a combination of the Theta Bike Shelters and Delta Cycle Shelters to make valuable use of larger areas. Two lockable gates can be fitted to one or both sides of the compound allowing 4 entrances. For extra security, gates can be added to bays of shelters within the enclosed compound. Call our Sales Department for a full quotation. 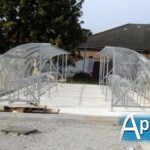 Bournemouth Cycle Compound Secure cycle compound with PET gate and covered walkway with 5mm thick transparent PET. Floor mounted individual Sheffield cycle stands are shown within the cycle compound. Description Theta T- Delta P/iR48/SECURE Compound Theta P- Delta P/iR48/SECURE Compound Theta T- Delta P/iR48/OPEN Compound Theta P- Delta P/iR48/OPEN Compound The above compounds are available in various combinations, with or without gates and/or fixed security panels.